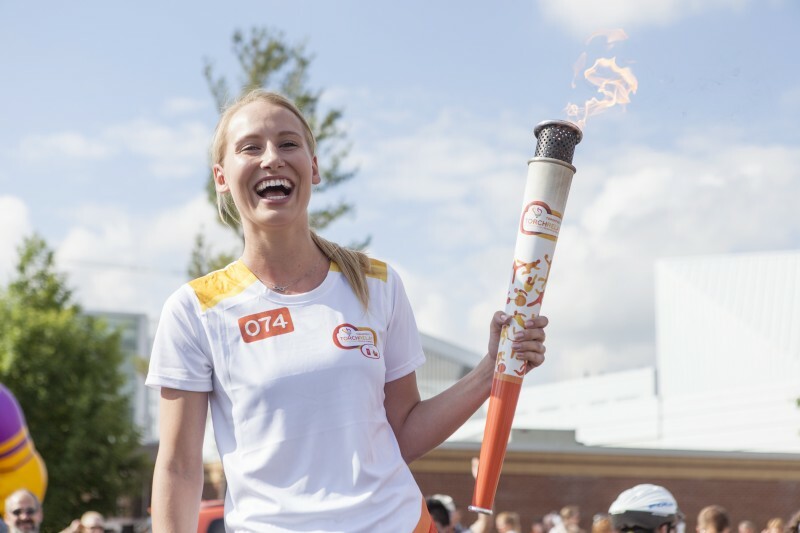 All eyes were turned to Mid Campus Drive on Wilfrid Laurier University’s Waterloo campus as women’s soccer striker Emily Brown carried the Pan Am and Para Pan Am torch toward the cheering crowd awaiting her on Alumni Field. Starting just passed the intersection between University Avenue west and Westmount Road north, Brown was the first torchbearer to travel with the torch in Waterloo. She ran 400-meters in 15 minutes and finished her relay at Alumni Field, where the crowd, along with her family and friends, cheered her on. Brown is one of 3,000 torchbearers chosen through a public process to carry the torch across Canada to bring the spirit of the Pan Am and Para Pan Am games to 130 communities. Laurier put Brown’s name forward months ago, only to find out she was accepted to run a few weeks afterwards. Brown jumped at the opportunity to be a torchbearer as soon as she found. The torch will land at Kitchener City Hall this evening where Canadian boxer Mandy Bujold will finish her leg of the relay for the final celebration of the day before the torch continues its travels to Toronto.